Victorian tiled floors are a popular feature in period houses and new builds trying to get that classic look. While they originated in the 19th century, they have a certain timeless quality that property owners love. 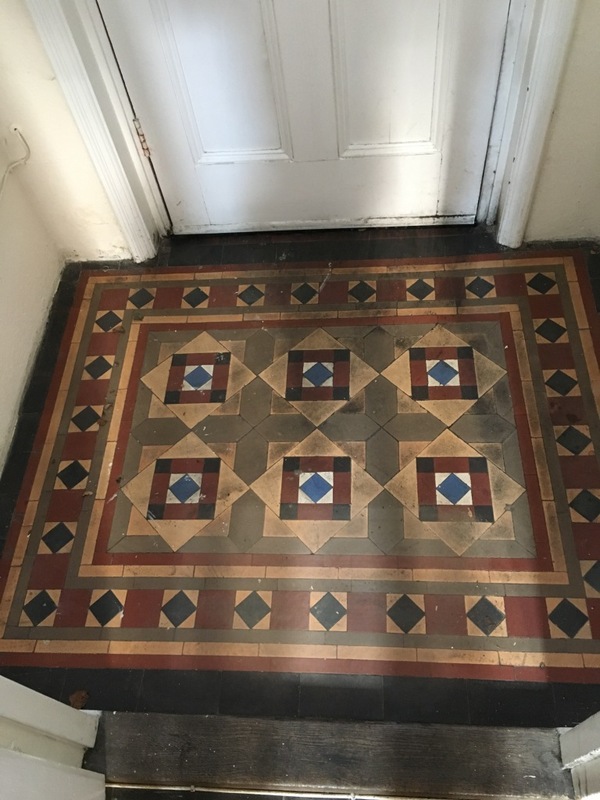 Historically due to their hard wearing qualities they were most commonly used for flooring high traffic areas such as lobbies and hallways, however Victorian tiles are porous and without the correct maintenance the tiles can start to lose their appearance very quickly. This customer from Swindon has an original Victorian tiled lobby at the front of their house that was suffering from this very same problem. Years worth of ingrained dirt and muck had completely sapped all colour and character from the tiles, and the customer was keen to get them back to looking their best. Whilst I was there inspecting the floor I agreed to run a test on the tiles to ascertain the results that could be achieved, this worked out well and the customer quickly booked me to carry out the full restoration. To provide the deep clean these tiles desperately needed, I opted to use a strong solution of Tile Doctor Pro Clean. Pro Clean is our go-to cleaner for most natural stone tiles since it is highly versatile. It is alkaline-based and therefore can be used on acid-sensitive tiles to break down ingrained dirt and any existing seal. We soaked the floor completely with the product and left it to dwell for roughly 15 minutes. This allows the Pro Clean to seep into the pores of the stone, get underneath and lift any ingrained dirt to the surface to be easily removed. I then attached a soft brush to a rotary machine and scrubbed the area throughly, with the tiles coming up very well. Once satisfied with the appearance of the tiles, I removed the dirty cleaning slurry with a wet vacuum and rinsed. Having removed many layers of muck it came as a surprise to find that there were a number of paint splashes that have previously had been hidden. I was able to promptly remove them using a hand razor scraper, before rinsing the area again several times to remove any surface contaminants and neutralise the area. I then left it to dry fully overnight. Upon my return to the property the next day I ran a few damp tests to check for excess moisture in the area. This is really important to check for as excess moisture can cloud the sealer and damage its ability to provide protection for the tiles. Once satisfied that the floor was completely dry, I sealed the floor with two coats of Tile Doctor Colour Grow. Colour Grow is an impregnating sealer that penetrates into the pores of the stone to act as a robust barrier against ingrained dirt. It also contains colour intensifying properties that really worked to enhance the fantastic coloured patterns of these Victorian tiles. With a thorough clean and a fresh seal applied, these tiles are now well prepared to endure further wear and tear, which is especially important in this high traffic area of the house. Certainly the customer was relieved and pleased to know that their fantastic Victorian tiles are protected for the long-term. Another satisfied customer for the Wiltshire Tile Doctor. 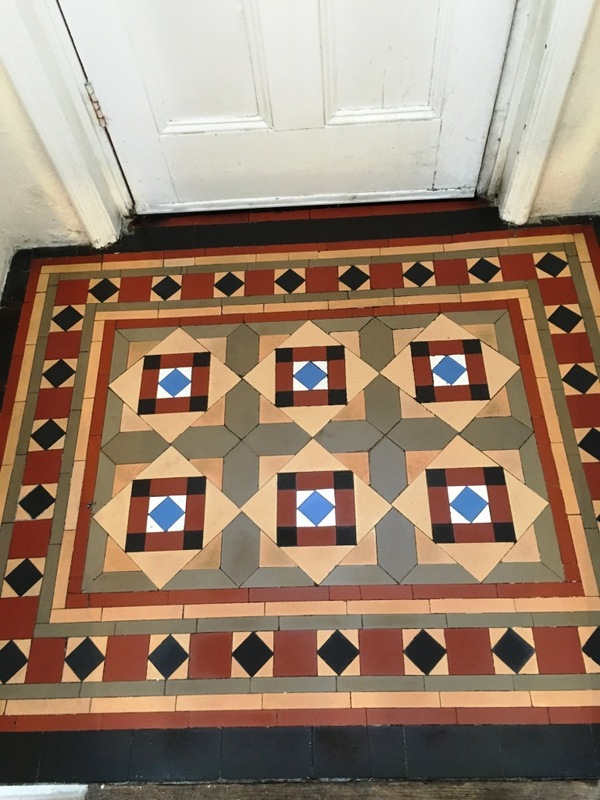 This entry was posted in Stone Sealing Products, Tile and Stone Problem Solvers and tagged lobby, swindon, tile cleaning, tile sealing, victorian tiles, wiltshire by AbzDominise. Bookmark the permalink.